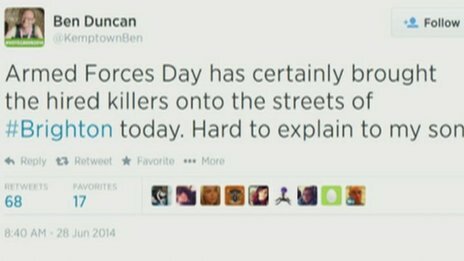 Bloggers4UKIP: Green councillor calls soldiers "hired killers"
Green Councillor, Ben Duncan, issued half an apology at the weekend for making offensive comments on Twitter on Armed Forces Day. Armed Forces Day has certainly brought the hired killers onto the streets of Brighton today. Hard to explain to my son! He apologised after his comments attracted widespread criticism but only for being "insensitive" to families who have lost relatives, not for branding all soldiers "hired killers" which he apparently still stands by.